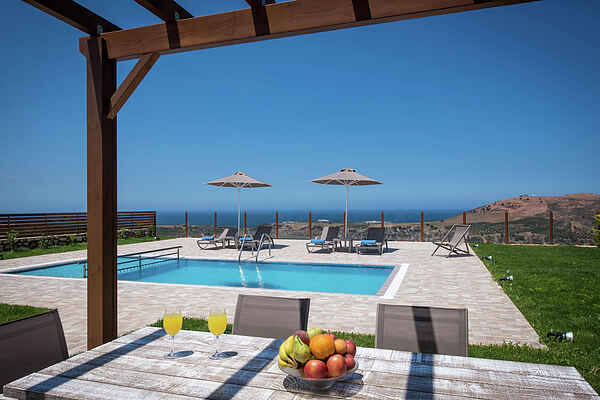 Private villas Thea-Latsimas enjoy a privileged hillside position overlooking the stunning Latsimas area and turquoise waters of the Aegean Sea. Surrounded by lush olive groves Thea-Latsimas villas are strategically located only 4 km from the stunning Geropotamos beach and 20 min drive from the beautiful Rethymno city. Moreover, there are numerous shops, cafes and Taverns at Aggeliana village only 4 km away from the complex. Rethymno is a lovely city with cultural significance, its Venetian port, fortress and old town. Thea-Latsimas two villa complex is designed with comfortable holiday living in mind and with many innovative architectural and environmentally friendly features. Each villa has a private pool, 2 bedrooms, 2 bathrooms, 1 WC and can accommodate up to 6 people. It has its own unique living space with the emphasis being on outdoor entertaining, dining and relaxing. All common amenities are available such as air condition, satellite TV, fireplace, BBQ area, internet WIFI and a fully equipped kitchen. Soft bedding and furnishing provide the maximum comfort with the use of natural and raw materials. The villas have safe and private parking.